In blender container, combine all marinade and sauce ingredients; blend until pureed. Place 1/2 cup mixture in 1-quart resealable food storage plastic bag; reserve remaining mixture in small saucepan for sauce. Add chicken breast halves to bag; seal bag and turn chicken to coat. Refrigerate 30 to 60 minutes to marinate, turning once. Heat grill. When ready to grill, remove chicken from marinade; reserve marinade. Place chicken and onion slices on gas grill over medium heat or on charcoal grill 4 to 6 inches from medium coals. Brush onion slices with reserved marinade. Cook 10 to 15 minutes or until chicken is fork-tender and juices run clear, turning once. Discard any remaining marinade. Meanwhile, heat reserved sauce in saucepan over low heat for 3 to 4 minutes, stirring occasionally. 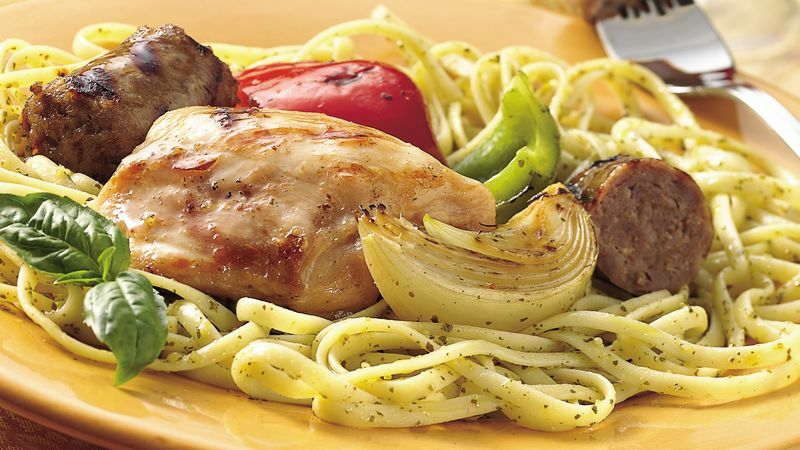 Serve sauce with chicken and onion slices. Nonfat dressing delivers great flavor with no extra fat grams. Try several brands to discover your favorite tomato-based nonfat dressing. Try pork chops in this recipe; use 1/2-inch chops and marinate them as directed. Grill for 10 to 15 minutes, or until the chops are no longer pink in the center, turning chops once. Take care not to overcook them; pork dries out very quickly. To broil chicken and onion slices, place on broiler pan; broil 4 to 6 inches from heat using times above as a guide, turning once. ®Vidalia is a registered trademark of the Georgia Department of Agriculture.